Teldio is a systems integrator and applications developer delivering solutions targeted at improving operational efficiency, employee safety & situational awareness for enterprise customers. The company was founded in early 2008 as a two-way radio applications developer. Our initial focus was on voice & data application development for radio networks but continues to evolve becoming more and more device agnostic. Teldio’s solutions are scalable and designed to help users link radio and telephony networks to other infrastructure & applications, delivering on the promise of unified communications. 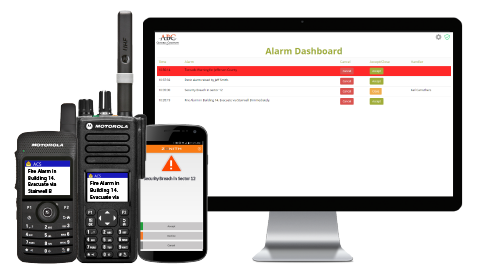 Our suite of applications includes cost-effective radio to telephony communication, alarm management & notification, lone worker monitoring, radio to radio recording, indoor & outdoor positioning, and more. Teldio is a group of energetic, fun-loving solutioneers who collaborate to make old technology new again. Our mission is to leverage and enhance the value of networks by providing innovative software solutions and superior customer support. We provide our channel partners with a distinct competitive advantage by helping them deliver cutting-edge solutions to their customers. How can you purchase Teldio applications? Teldio integrates its applications and solutions via certified resellers. We build strong relationships with our channel partners and work closely with them to ensure their customers receive a solution that responds directly to their needs. If you are looking for a reseller to purchase a Teldio application contact us and we will happily refer you to someone working in your area. For all other opportunities contact us directly! At Teldio, we value hard work, having fun, integrity and honesty, passion and creativity, progressive thinking, and a sense of family/community. We drive to be a relevant player by providing preconfigured and custom solutions to meet our customers’ specific needs. Our mantra is encapsulated by the following: Enhance the Power of Network Communications. The company’s world headquarters are located in Ottawa, Canada. We have regional sales presence across the US to better serve our North American Channel Partners. Our reach extends to other parts of the world: combining our network of strategic partners, Teldio has representation in over 90 countries across 6 continents. Contact us for all inquiries!